In May 2009, a week after returning from a 13 day trip to the Mediterranean, I received a call that would make a huge impact on my life. It was someone telling me that I was one of the winners in the Jeopardy!’s Galapagos Adventure with Alex Trebek Sweepstakes. As I would later learn, there had been more than 2.5 million entries and I was just one of 25 people selected to go on the trip along with a guest. The odds still stagger me and I truly find it humbling. While I knew that the trip would be with Trebek and the Jeopardy crew, I had no idea just how remarkable the adventure would be. The first Trebek sighting was in Miami as we all waited for the flight to Guayaquil, Ecuador, where we would overnight before leaving for the Galapagos. It was a strange situation, sitting there in the American Airlines gate area watching Alex Trebek and his wife in their comfy travel clothes and carryon bags. I would later learn that those tiny bags contained their clothes for the entire week. As it turns out, Mr. Trebek does not like to check his bags. Except for the brief sighting, we really didn’t get to interact with Alex until we arrived in the Galapagos. We were getting off the bus and lining up to take the Zodiacs to the Lindblad/National Geographic ship Endeavour and by chance, Alex, his wife, the Jeopardy producer and Scott and I all ended up in the same Zodiac. Actually, it was a little embarrassing for a first meeting because Scott could not figure out the life jacket and had somehow tied his arms behind him, forcing Mrs. Trebek to come to the rescue. As we would soon see, it was just one of the many gestures of kindness from the Trebeks. 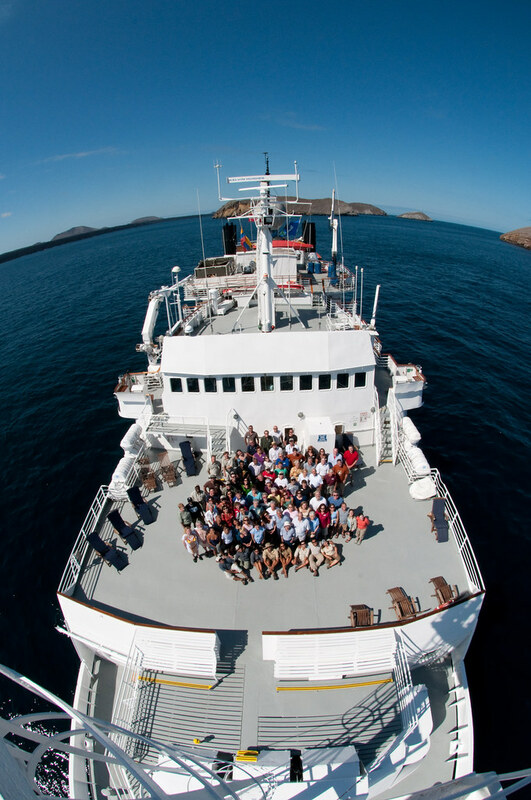 If you’re not familiar with Lindblad, their fleet is comprised of small, expeditionary ships with a focus on learning and exploration. That’s not to say they aren’t comfortable; they do a marvelous job of combining luxury with the feeling that you’re setting sail with Jacques Cousteau. Regardless, it was a small ship and there weren’t very many places to hide. Most of my fellow winners were great, and almost all gave the Trebeks their space when needed. For a public figure I was a little surprised that Alex seemed to be slightly introverted and felt bad that some fellow passengers would not leave the poor man alone. In spite of some of the awkward moments he was forced into, he was kind and gracious to everyone. We were fortunate enough to join Alex and his wife on several hikes around the various islands and over the course of a week came to know them both very well. It’s amazing how a long, arduous hike builds instant friendship and camaraderie. By the end of our cruise, Scott and I seemed to find ourselves with the Trebeks most of the time, usually through pure chance. It was a marvelous experience to see the wonders of the Galapagos fascinate and provide pure enjoyment to people as knowledgeable and well traveled as the Trebeks. The Trebeks, as I’ve mentioned, weren’t the only Jeopardy representatives there, the Clue Crew and various technical pros were on the cruise as well. We had some great evenings staying up too late with them, playing cards, drinking beer and telling stories. Some of the cameramen have had fascinating careers and it was a treat to ask them questions and hear some fabulous stories as we drifted in the quiet waters of the Galapagos. Just like the Trebeks, I saw the same looks of childlike wonder on their faces as we all discovered some of the treasures of the islands together. The Galapagos has a unique ability to do that, to make the most important, wealthy or intelligent people melt into a puddle of awe and intense curiosity. Everyone turns into a kid again in the Galapagos. On the last day everyone was teary-eyed and spent the morning writing down everyone’s email address. I’ve been in those situations before, spending a week with a small group of people and promising to be best friends forever. It usually doesn’t turn out that way but, amazingly enough, more than a year later we all do still stay in touch. That trip did more than build a tremendous reservoir of memories of nature and wildlife, it created friendships that will last a lifetime. And what about Alex? We haven’t seen either he or his wife since, but they know that our door is always open. What a cool adventure! Lucky boy! This is by far the coolest post! You’re so lucky to have won; congrats! I’ll be a huge geek and admit I love Jeopardy, since I was a kid! That sure was the experience of a lifetime. Thanks for sharing!! aw thanks! It is a trip I will always remember, for many reasons. That is awesome! I knew you won a Galapagos trip, but had no idea who it was through or that you went with Alex Trebeck. That is just very cool. This is the coolest thing I’ve read in awhile. Funny how the idea of encountering celebrities makes children out of some people. But I must admit, Alex Trebek is one of my all time heroes, which after seeing that in black and white sounds pretty geeky. Great story though. Thanks for posting it! Thanks Nico! We are Jeopardy nerds too, so it was a real treat to spend a week with the Jeopardy! folks. 🙂 There’s much more to share, but that will have to be in future posts. Great trip. I hope to check out the Galapagos one day. Awesome that u got to see the Jeopardy guy. He looks much taller on the show than he does in the above picture haha. Congratulations on winning a spot on the cruise. Great write-up summary. Sounds like a blast! I used to have such a crush on Alex. I have a thing for intelligent men. What an incredible experience!